Since little Nova's arrival almost 3 weeks ago, I really haven't had much time to do anything other than breastfeed, change diapers, cat nap and have a sitz bath once a day. That doesn't stop me from dreaming and planning my future sewing projects however! I started making a baby sling just before Nova's birth which I hope to finish over the next few days. I also made her a pair of scratch mittens from Home Sweet Homebodies free pattern and a newborn sized hat from the free Whip Up pattern. She hates wearing the mittens and takes them off as fast as I can put them on... So I just waited until she was asleep one day and then I cut her sharp little talons. But she doesn't mind the hat. Isn't it just soooo stinking cute??? 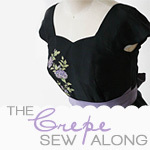 We have a couple of weddings to go to this summer and fall and would like to make a new dress to wear. Plus I want to make some mother/daughter matching outfits for Nova and I! 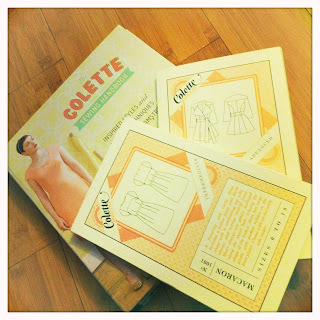 My SIL and BIL gave me a copy of the Colette Sewing Handbook for Christmas along with the Macaron and Lady Grey patterns. I'm so excited to make both! I also have the Minoru Jacket pattern from Sewaholic that I hope to make up soon. Perhaps it's just wishful thinking that I will have some spare time in the next year? LOL!